The server offers a highly configurable interface for enabling the different file sharing protocols on a domain. Listeners can be added, edited, and deleted using the appropriately labeled button. Each domain can listen on multiple ports and IP addresses by adding a listener bound to the desired IP address and port. In addition to selecting these connection attributes for a listener, a file sharing protocol must also be selected. FTP is the traditional protocol for transferring files over the Internet. It normally operates on the default port 21. Traditionally, FTP is handled in plain-text, however SSL connections are explicitly supported through the use of the AUTH command. 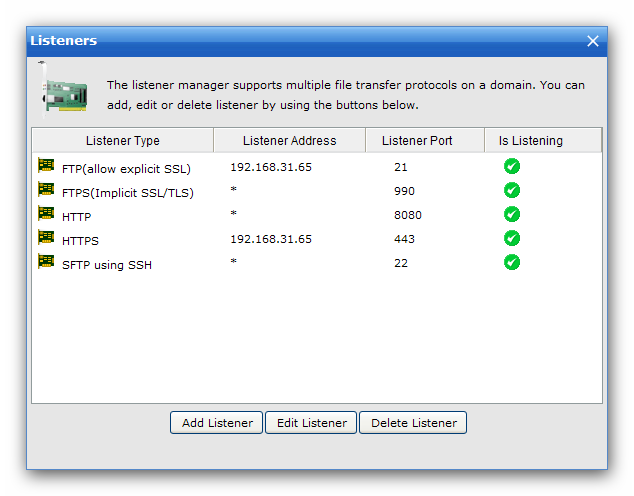 FTPS is identical to FTP, however connecting to a listener configured for FTPS means that an SSL connection is required before any protocol communication is performed. This is commonly referred to as Implicit FTPS, which normally takes place on the default port 990. SFTP is a secure method of transferring files through a secure shell session. It performs all protocol communications and data transfers over the same port eliminating the need to open multiple ports in firewalls as is commonly required when using FTP. SFTP sessions are always encrypted. SFTP operates on the default port 22. HTTP is the protocol used to browse Web sites. It's also a simple method for downloading and transferring files. One benefit to adding an HTTP listener to a Domain is the availability of the Web Client, which allows users to transfer files to and from your File Server without the need for a stand-alone client. HTTP traditionally operates on port 80. HTTPS is identical to HTTP except all communications are secured using SSL. Like FTPS, a secure connection is implied when connecting to a listener running the HTTPS protocol. The default port for HTTPS is 443. After clicking the Add Listener button, you will see the listener configuration dialog. After configuring each of the listener options, click the OK button to add the listener to the Domain. Select the desired file sharing protocol that is to be supported by this listener. Each listener can only support a single protocol. To add more file sharing protocols to the Domain, create new listeners for each protocol. A brief description of the support file sharing protocols is found above. You can select the IP address that you want to bind here. Leaving the field * tells server to listen on all available IP addresses.